Supercharged with alpha arbutin (a safe skin-lightening ingredient that reduces melanin production), this high-potency, gel-like serum targets the look of hyper-pigmentation and dark spots to reveal more even, younger-looking skin. Also enhanced with hyaluronic acid, the serum delivers its advanced active ingredients deep into skin. I've been struggling with acne and acne scars for more than 5 years and this is the only product that worked for me. Visible results in less than a week. This thing didn't do pretty much anything for my skin after a month of use, except for breaking me out every now and then. Definitely happy with this product, bought it a 2nd time. Skin is more bright, less dark spots. Last week my acne was so bad and the scars were so pigmented so I quickly purchased this in hope that it would help my post pill acne that has been a constant battle. Less than a week later, my scars have lightened, my skin looks SO much better and I can actually look in the mirror without makeup on! Amazing I will keep re-purchasing!! Love all the ordinary products and the Cult Beauty service is amazing... 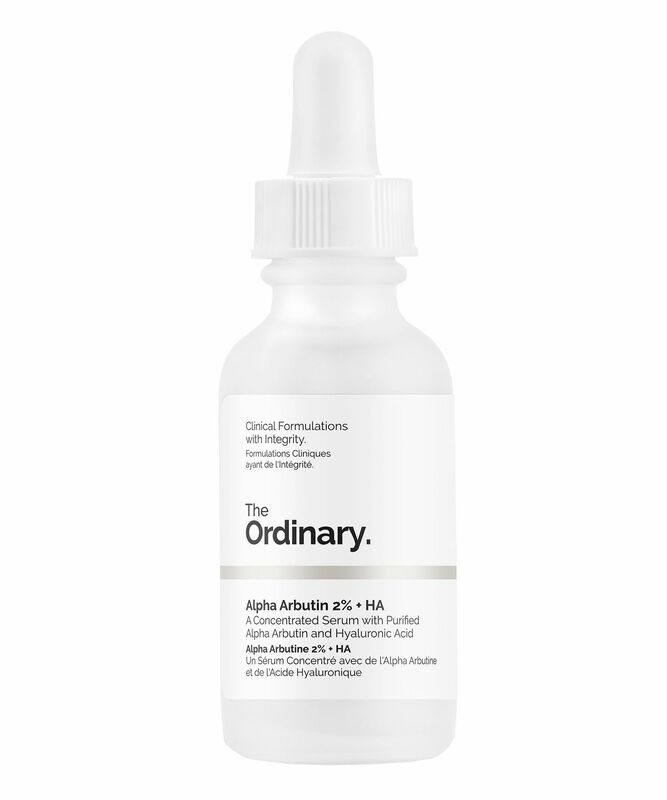 I am new convert and every week I just keep buying the ordinary products in awe how amazing my skin looks since started using this products. Really disappointing results as I was very excited to use it. I tried it in the night and the next day had very red cheeks with little bumps, which I had never experienced before. So big No for me. I have been using this products for about 2 weeks, and although I am not sure about any pigmentation or scars fading or disappearing (yet), my skin texture has improved and have overall brightness which I am happy with. I use this along with 2 other Ordinary products and moisturizer on top, and the mixture is working well with my skin. I only use 2 drops each application, morning and evening- a little goes a long way, as the HA from this brand is quite sticky and a bit goopy. So far so good- Happy! I will continue to use this! I've just bought my third bottle. I now feel confident without wearing makeup majority of the time. But this isn't a miracle worker, i still expect the odd spots sometimes when I'm due my period. Wouldn't stop using now! Fast delivery too. I've been using this consistently for almost 2 months and unfortunately, I've seen no difference in my skin. This product was my introduction to this brand and I got an extra bottle for my mum. Well what a result, her sun spots of years are fading and she is on her 2nd bottle. Love this! Unfortunately as I started using it I spent the day out in the sun. The product helped a lot to clear the sun burn and now I'm just waiting to see it work on my dark marks. So far so good. I love it and I will repurchase it all the time! At first, I thought it doesn't work, but after some time I realized it really does. I only use it in the evening, so if u use it twice per day maybe it has even better results! Brilliant product.. it really does work. This mid-tone complexion black girl loves it! I started using The Ordinary about a month ago and I love it! I used this Alpha Arbutin in conjunction with the Hylaronic Acid and the 100% Plant m-Derived Squalane. My skin texture is smoother, I’ve seen a dramatic decrease in the dark marks on my cheeks, and I feel like I’m glowing! This product is amazing. I have been using it for a month now and I can see visible improvements to the hyperpigmentation on my face. As a dark skin girl I was skeptical I must say; however, I am very impressed. Luv it! Helps brightening and reduce redness. I have combination skin and I have suffered from breakouts and scarring for years. This didn't clear it all (teenage hormones are still alive and well) but this got rid of the majority of my scarring and has improved my breakouts by a lot in the space of a couple of months (although I noticed results within a couple of days). מוצר מעולה מבהיר פיגמהטציה ונעים על העור *** An excellent product that brightens pigmentation and improves the skin. This is my second bottle with alpha arbutin. it works like a magic. Really love how it works on my skin. Sadly Cult Beauty have stopped shipped to Malaysia. I have had problems with acne spot for so long because my skin condition is always hard to faded those scars. This one make my skin lighter obviously and can fade acne scars a little bit as I use this for 1.5 months. Anyway I am so sad that Cult Beauty won't ship The Ordinary products to my country anymore. Cult Beauty team have always answered my question and shipping products faster than other website. Please reconsider to shipped this to Thailand again. Thank you. My first purchase and I love it! I’ve used this for a few weeks now, and I definitely see a difference. I’ve tried all sorts of stuff that has never worked, this on the other hand, so far, is the best ever! This is amazing and is always a hot selling item and almost everyone I know is using it. Absolutely love this. Works amazing on my olive skin. I do have the occasional breakout and they leave hyperpigmentation behind. This helps fade those pesky flaws away and I'm now flaw free. I do use this together with the Niacinamide to keep my face blemish free. Absolutely love it! So in summer 2017 I had acne for the first time in my life (I'm 19) I got rid of it thanks to my dermatologist but I was left with some dark spots all over my cheeks. I decided to give this serum a go and at first, I was very disappointed and sceptical. One month in and there were no results, I was even thinking that it's causing me to break out but I figured out that if I bought it I'm going to use it up and then decide if it was a waste of money or not. I started using this product in February (I've taken a before picture just to keep track of the progress) and now when I'm sitting down to writing this review it's may. So that means that I have been using this product for good 3 months, I snapped some pictures again I tried to keep the lighting very similar and YES THERE IS A DIFFERENCE! The spots are still on there but they are far less prominent! Next on my wishlist is the rosehip oil I heard that is good for hyperpigmentation as well :) Would recommend if you don't mind waiting for the result (a chemical peel at a salon will give you better results quicker but it's more expensive). I don't have enough words to describe this amazing product! It's like a magic elixir. My pigmentation has faded after 3 weeks of consistently using it, am and pm. This is coming from someone who has gone for peels, used derma rollers, bio-oil, skin lighteners, you name it. My friend recommended this to me, literally so grateful! Don't even think twice about it, just buy it and see for yourself. £7, cant go wrong! This really helped with my scaring and pigmentation! I'm mixed and always get dark spots after a pimple. This product has completely removed these and I now have even skin color again. It has not removed old pigment spots, but I will continue to use this for a few months. Keep in mind that pigment spots take a long time to remove. I have been using this product for the past 2 months every day and night. Good to remove spots, but did absolutely ZERO to my skin. First product from The Ordinary and will not be the last. I did not see my pigmentation (from sun damage) lighten only until my first bottle was nearly empty. Suddenly the brown spots look like they are breaking down. On my 2nd bottle now and I'm seeing further improvement, some spots are no longer visible. Texture is tacky but just apply a thin layer of moisturiser over it and all is well. At this price point, I wasn't expecting groundbreaking results but I did see my dark spots / acne scars / hyperpigmentation lighten gradually after using the whole bottle so I was pleasantly surprised. I tend to use it as a spot treatment and has served me well. Prior to using this, my skin hadn't experienced any breakouts for over a month. The first week of using this product I started to see random black heads and little bumps forming on my forehead and cheeks. The blackheads eventually turned into spots and this led to a big breakout. I stopped using it and am waiting for the blackheads and bumps to fade. Also I saw no difference in my pre-existing hyper pigmentation. Honestly worst product for skin and don't recommend. I&#8217;m the only one who&#8217;s noticed! I’ve been using this for most mornings and evenings for a few weeks now and I’ve definitely noticed a more even tone in my skin. However, I really hoped that it would make my brown age spot fade or disappear, but sadly not yet. I will be buying it again as I like the overall effect. It highly hydrates my skin and helps brighten my uneven dry skin. Love to use in the morning with cream moisturizer or solely after evening cleansing and toning. I definitely noticed that my skin got more even, brighter and some of my small acne scars started to fade. I have currently used half the bottle, and I will buy again! I have dry, dull and uneven skin, and this product has helped in each of these areas. The only negative thing about it, is that if I use it every day, I get teeny tiny bumps on my face. They disappear quickly, but I find it weird since I don't have sensitive skin. Overall good product!!! This product is wonderful and the best one I have tried so far for reducing my deep acne scars. I like the gel consistency and that there is no smell. It is not drying, does not pill and does not cause any breakouts. Unlike other products that are supposed to help with dark spots - this product actually makes the spots and scars themselves lighter - rather than making the skin around the scars lighter and this way actually emphasising the scars. I nearly used up the while bottle and my skin looks so much better and spots are less visible. I love it so much that I stocked up and want to try it with micro-needling tool. I was so excited to try this product, as I saw quite good reviews and I have a sensitive skin around my cheeks, and I saw in one of the website it says it’s good for sensitive skin.Although quite disappointed as I applied in the night and the next morning, my skin was bit itchy and around my cheeks was quite red and I had quite a few little bumps, which I never suffered from! So I guess it’s big No for me. Has visibly reduced hyperpigmentation and acne scars! Also, added a nice glow to my face. Works great on sensitive skin which I have. I really recommend this product. I'm quite dark skinned - MAC NW55/Fenty 460 or 480. I got this to help fade acne scars and hyper-pigmentation I've had for years from teenage acne. Used this as instructed (AM and PM) and after less than a month, my scars are visibly faded, my skin tone is more even, and it has not lightened my skintone which is amazing. I love it! Will re-purchase and likely reduce to either AM or PM once I'm satisfied with the evenness of my skin. My skin has felt brighter and better since I have been using this. I have to be careful in this harsh winter as exfoliating can leave my skin sensitive and it's only on those days that this has been too harsh for my skin. I bought this item after seeing all the good reviews but unfortunately, my skin turned worse after using it. It is very strong so think before using it if you have sensitive skin. My perfectly good skin is horrible now. I honestly wouldn’t advise buying it. Truly, life changing. Also, I have been using for one month now. And it has completely helped my skin, to miniseries pores and shrink the size. Totally worth it. Great if you have any sun spots or acne marks to improve. Also, don't forget your sunscreen. Power combination. My first ordinary product! I have sensitive skin. It just made my skin so plump and clear. My complexion improved. Recommended to many friends and I've ordered for them too. I combine it a few times a week with the lactic acid and I can say that even though my acne didn't go away, my face doesn't get dry anymore and pigmentation goes away faster. Enemy to my acne scars. It works well on me but please ship this again to Malaysia I don't know where I can buy this stock again. Started using a few days ago and already in love. Very light texture and skin is soft. I think it will become part of daily skincare routine. I bought for hyperpigmentation on forehead. After a few weeks there is no real change. £7 wasted. Texture is nice and not greasy. That's the only positive. I can't live without this serum. Very light texture and suits my skin well. I have repeatedly purchased this many times. It's a fab product feels divine on my skin. I use it with "Niacinamide" in the morning and with“azelaic acid” at night. My skin appears brighter and softer! You deserve it. This serum really fades my scars after almost 4 months, it takes time but totally worth it! Worked so well with snail mucin and azelaic acid. My skin appears brighter and softer! Love it! I really like to use it since making my skin more brightening. Will keep repurchasing. I love this product as it fades away my acne scars, I use it with AGS and both works wonder to my skin. Will definitely buy this again. I’ve been using this for a month and it has helped to smooth out my skin especially the chin area where I have hyper pigmentation and dryness. I really like this. I use this with the hyaluronic acid and Paula's Choice azelaic acid. Lovely combination, my skin looks so different lately. It's bright and my acne scarring is slowly fading. I have dark skin, warm and acne prone, I used to have a 'The ordinary craze' but this is definitely one of the ones that work! I reordered this because it helped me clear the dark spots and hyper-pigmentation caused by acne and the sun respectively. It's such a miracle product- but I'd paired it with retinol/retinoid, to see the full potential of it. This is my holy grail product. A MUST HAVE in every skincare routine. It makes my scars fade even though it might take some time. I LOVE IT. I will always repurchase. My skin is very scared from acne throughout my life, my pigment was really bad especially on and around my chin and mouth area! This product is amazing I’ve just finished my first bottle about to purchase my second. My skin is so clear there are still a couple of deep scars which I don’t think will ever go, but the redness and darker areas have gone, I used this product pretty much every morning and night since July 2017 so it has lasted me 5 months. I can not rate it enough! Also, have a lot of other products from the range and love them all. Thank you! Didn't help with skin pigmentation. Since I started using the ordinary my skin has improved. It's softer smoother and although my dark patch for the sun hasn't disappeared, gradually lightening up. Highly recommend.